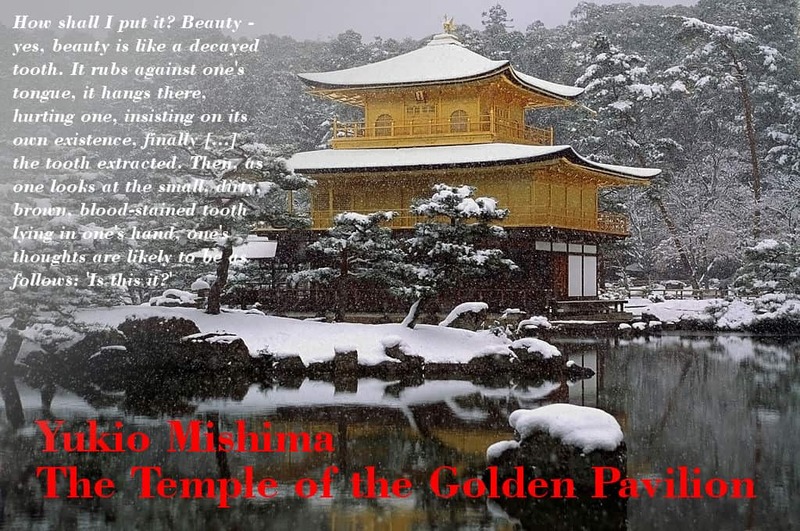 A masterpiece of modern Japanese literature: Yukio Mishima (三島由紀夫) The Temple of the Golden Pavilion (金閣寺). The fictional story about the very real arson attack that destroyed the Golden Pavilion in 1950. A bit different treatise on beauty and ugliness! Mizoguchi, a stutterer, is from young years on taken by a near mystical imagination of the Golden Pavilion, influence by his father who considers it the most beautiful object in the world. After his father’s death he moves to Kyoto and becomes acolyte in the temple. He develops a friendship with Kashiwagi, who uses his clubfeet to make women feel sorry for him and make them fall in love with his clubfeet, as he puts it. Kashiwagi also puts Mizoguchi onto the first tracks of amorous experiences, but Mizoguchi invariably turns out to be impotent – but not due to his stuttering, but due to the image of the Golden Pavilion appearing in the essential moment and destroying every chance. Yes, this was really the coast of the Sea of Japan! Here was the source of all my unhappiness, of all my gloomy thoughts, the origin of all my ugliness and all my strength. It was a wild sea. Mizoguchi is getting more and more mentally about his relation with the head monk, neglects his studies, and after a stark reprimand he escapes to the north coast, from where he is brought back by police to the temple. He decides to burn down the Golden Pavilion, which has taken more and more command of his thinking and doing. He carries out the deed with the aim to burn himself in the top floor, but escapes in the last second to retreat into the hills to watch the spectacle. Closely based on the true story of the arsonist of the Golden Pavilion, whom Mishima even visited in prison, the book is a treatise about beauty and ugly. At his trial he [the real arsonist] said: “I hate myself, my evil, ugly, stammering self.” Yet he also said that he did not in any way regret having burned down the Kinkakuji. Mishima is master in showing these two extremes by contrasting the refined qualities of Japanese culture – flower arrangement, playing the shakuhachi, … – with immediate outburst of contrasting behavior: cold and brutal recklessness. Take for example the scene were Kashiwagi is arranging flowers, stolen by Mizoguchi from the temple grounds, while Mizoguchi is playing the flute. They also discuss koans and various interpretations. Enters the Ikebana teacher, and mistress of Kashiwagi. She congratulates Kashiwagi to his excellent arrangement, which he answers coldly by quitting their relationship, both as teacher as well as mistress, and telling her not to see him again in a formal style. She, still ceremonially kneeling, suddenly destroys the flower arrangement, only to be beaten and thrown out by Kashiwagi. And the beauty and harmony has turned to ugliness and hate in seconds. Beauty and Ugliness, two sides of the same medal, or inherently the same, because it is only up to the point of view. Mishima ingeniously plays with this duality, and leads us through the slow and painful development of Mizoguchi to the bitter end, which finally gives him freedom, freedom from the force of beauty. Sometimes seeing how our society is obsessed with beauty – I cannot get rid of the feeling that there are far more Mizoguchis at heart.